Rhodes is one of the largest and most visited of the Greek Islands. It has beautiful beaches, impressive archaeological sites, and a fascinating medieval town. Many of the most active tourist resorts are on the northern coast and the south has peaceful beaches and a relaxed setting. There are only a handful of true hostels on the island. Budget travelers may find more options if they consider affordable hotels in addition to the more traditional hostels. It's best to consider what your goal is in visiting Rhodes when choosing accommodation. Location on the island can be very important. 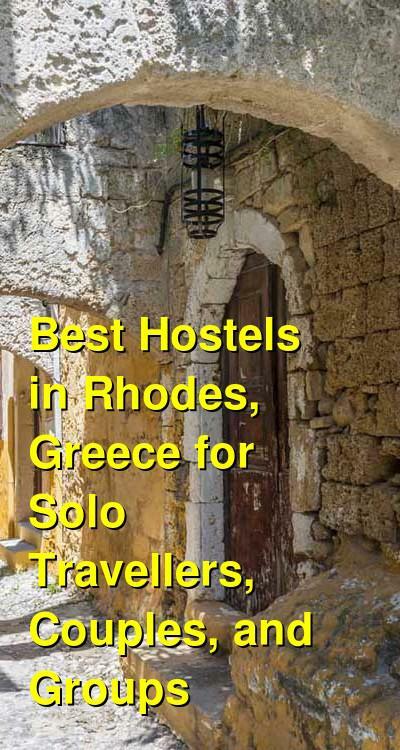 How much do hostels in Rhodes cost? A good hostel for solo travellers and couples. Argo Hostel is a beautiful place to stay in Rhodes, Greece. It's located in Faliraki and is just a four minute walk to the beach and a two minute walk from the town's vibrant nightlife scene. There are also many shops and restaurants in the area. The hostel has only two bed dorms and twin or double private rooms, and the price is quite reasonable. The atmosphere is social and you'll likely meet some friends while you're in town, but most would consider it more of a hotel than a hostel. There are 40 rooms in total that are either doubles or twins. They're split between the ground floor and first floor and each room has a private bathroom and either a patio or balcony. Wi-fi and air conditioning are available in every room free of charge. A free continental breakfast is also included in the price of the room. The hostel is surrounded by beautiful gardens and has a large pool that guests can enjoy. The town of Faliraki is the place to go to on Rhodes if you're looking for a party. The place comes to life at night when the many clubs and bars are in full swing. There are also beautiful beaches in the area and no shortage of water sports that you can try. If you're coming to Rhodes to have adrenaline filled activities during the day and party late into the night, then this is a good place to stay. A good hostel for couples, solo travellers, small groups, and families. Stay Hostel is conveniently located right in the heart of Rhodes Town. There are several good beaches that are about a ten minute walk away and the Old Town is also just ten minutes away. Located in the area's new town, many restaurants and shops are nearby and the main bus station is just five minutes away. Although the hostel is in the middle of town, it's also on a quiet street. The hostel is a fun and social place to stay and the staff regularly organize activities for guests. There are regular barbecue nights, cooking classes, bar crawls, movie nights, and live music evenings. The staff can also help you arrange any number of excursions that you might be interested in. There are all the standard amenities available to guests including a large shared kitchen, large security lockers, vending machines, and outdoor space. There are also board games, a library, and wi-fi available to guests. Both private rooms and dorms are available. Single and double private rooms are available as are triple, quad and six bed family rooms. Dorms sleep up to six guests and there are female only rooms available. Mango Rooms is located in the middle of Rhodes Town Old Town. 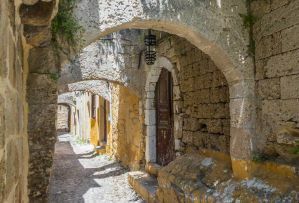 It has a view of Dorieos Square and is near the oldest mosque on the island as well as the 12th century Orthodox Church of Saint Fanourios. Mango Rooms is technically a hotel, not a hostel, but it is in a very convenient location and has affordable prices that appeal to budget conscience travelers. It's also open year around. The hotel has been recently renovated and each room has its own private bathroom. All rooms are also air conditioned and have televisions, refrigerators, ceiling fans, and safety deposit boxes. Free wi-fi is also available. The building offers a wonderful view from its rooftop. It's the perfect setting to sit back with a cold drink and soak up the sun. There is also a Greek cafe and restaurant downstairs, although the restaurant is only open during the summer months. Private rooms are available at the hotel and include singles, doubles, and triples.